Here is the link: Dolls ‘N’ Cupcakes our new blog! Sooo yeah! Adios amigos! Te veo pronto! Hi guys! Soooo happy 2018!!!! So the secret Annabelle and Ruthie were going to tell you is that I’m not going to post anything on Sam’s Life ever again. I’m working on a new blog currently! Sorry I couldn’t finish it in time, but basically, new year, new blog! Well, technically I will have one last post giving you all the link to my new blog. Today I could possibly post that link if I’m quick enough, but most likely not! 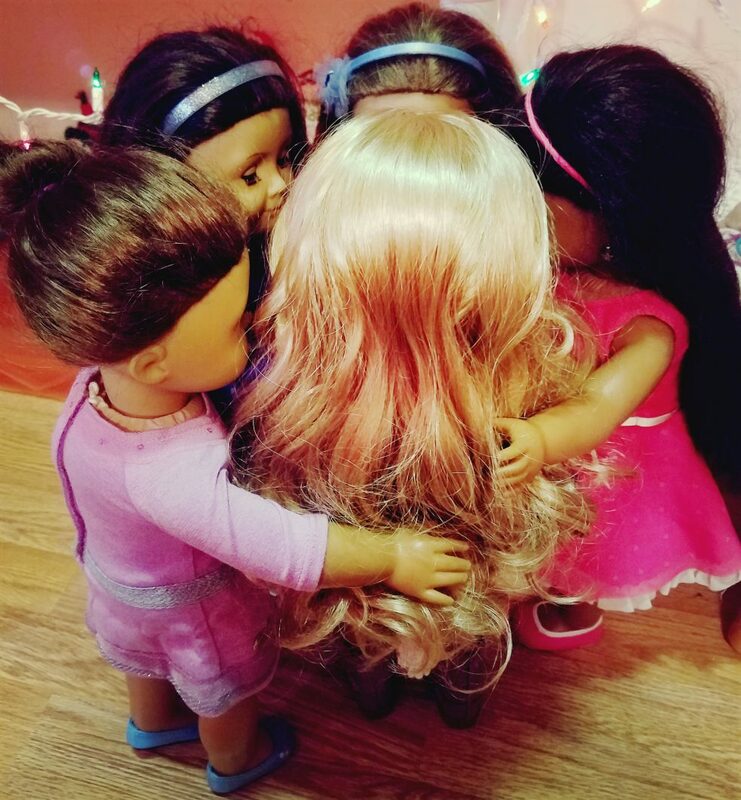 The girls enjoyed a nice dinner that Sam’s grandma made and Annabelle realized that they were a sleepover, but what Ruthie said when she opened the door still, she could not figure out why she said that. After dinner and dessert, the girls watched some Disney Channel together. Soon though, it was time for bed. Annabelle already had on her pajamas so she got her sleeping bag and her stuffies (stuffed animals) all set so she would be ready to climb in bed. Soon after Ruthie had gotten on her pajamas too, so she came and sat next to Annabelle. What did you mean ‘secrets to spill’ when you said that before? Well you see, tomorrow (Friday) is when you and I get to post something HUGE on the blog, but our other sisters don’t know the secret yet. I do, soon so will you. Oh ok. I’ll wait! See ya tomorrow! Goodnight. “I’ll get it!” Ruthie cried. Ruthie already is on her way downstairs when Violet and Josie finally manage to get Kanania up. It’s Christmas so no one cares about their hair, even Josie which is saying something! Quickly Ruthie pushes the dining room table out of the way so they can open presents. Then soon everyone rushed over to their full stockings and opened them crying out in delight. I got a purple haired mermaid!!! She’s so pretty!!! I got sweet sunglasses! I needed new ones! OMG! It’s soooooo cuteeee! It’s a little pink fox with lip gloss inside! Then the stockings were empty so Kanania started passing out presents from under the trees. Everyone is happy with their Christmas preasents so basically it was a great day! Everyone got want they wanted! Kanania got her camera. Ruthie got her lip gloss. Violet got her mermaid. And Josie got her sparkly, flower headbands, and now all that’s missing is the new sister… Who is she anyway? Merry Christmas everyone! Annabelle Lovegood will have a big photostory tomorrow and a big suprise will be on January 1st 2018! I’M TOTALLY HAVEING A FREAKING HEART ATTACK RIGHT NOW!!!!! !